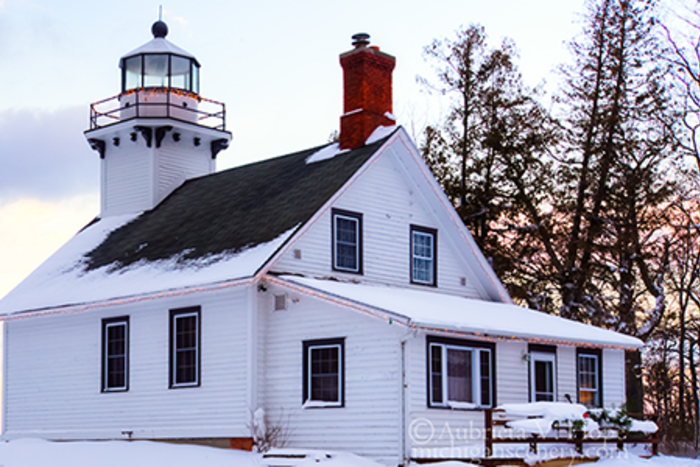 Mission Point Lighthouse in Winter: Where The Road Ends and the Adventure Begins! Landscape photographer Aubrieta Hope invites us to travel to the tip of the Old Mission Peninsula this winter to experience a perfect northwest Michigan escape. Breath-taking scenery, a historic lighthouse, and outdoor recreation await at Old Mission Lighthouse Park, just 20 minutes from Traverse City. To get there, drive the length of Old Mission Peninsula on the famous M-37. Ranked by USA Today among the Top Ten Most Beautiful Coastal Drives, M-37 offers stunning views of Lake Michigan, as it meanders past picturesque winter scenes in the vineyards and orchards. At the road&apos;s end, the Mission Point Lighthouse stands guard on a sandy bluff overlooking Grand Traverse Bay. Established in 1870, this historic structure attracts thousands of visitors each year. Most arrive during the summer and autumn to tour the building, picnic on the lawn, or splash in the lake, but the snow season ushers in a quieter time. Winter transforms the bay with sparkling ice and fills the surrounding woodlands with fresh powder. More than 600 pristine acres adjoin the lighthouse, with 10 miles of trails winding through Lighthouse Park and its neighbor, Old Mission Point Park. These gently rolling paths and two-tracks offer ideal conditions for snowshoeing, cross-country skiing and fat tire biking. Even on the coldest of winter days, the forest trails provide shelter from the wind, allowing for a pleasant outdoor experience. (For safety, stick close to the beach, and avoid venturing out onto the lake, even if it looks frozen.) When the temperatures are milder, it&apos;s fun to explore the ridges and shoreline along the bay. The lighthouse is very scenic in the winter, and so is the Hessler Log House, which is located a few steps away. Built in 1856 with hand-hewn timbers, this snug cabin was home to Mary and Joseph Hessler, one of the first families to settle in the area. It&apos;s been carefully preserved to provide a glimpse of Old Mission&apos;s pioneer days. The serenity and amazing photo opportunities will probably inspire you to linger for awhile. If the weather is favorable, consider staying until nightfall. Snow squalls sometimes move quickly over the lake, creating beautiful pastel sunsets. The nights are magical at Mission Point, especially the ones graced with the moon and stars. These celestial "night lights" create surprisingly bright conditions during the winter, casting a warm glow over the lighthouse and the beach. I photographed this moonrise a couple of years ago and was surprised to see lights in all the windows. Even in winter, the lighthouse is staffed by volunteer lighthouse keepers, under the guidance of Peninsula Township. The Township has cared for the lighthouse since 1948, providing visitors an intimate look at the early years of life-saving on the Great Lakes. An extensive restoration and beautification project was completed just last September. The lighthouse no longer serves as a beacon for navigation on Grand Traverse Bay. (It was decommissioned in 1933.) But Mission Point is still a beacon, one that shines in every season, attracting visitors from around the world. For additional information about the lighthouse and the volunteer lighthouse keeper program, visit their website.